The Youthful Parkinson Circle (YPC) support group is open to Parkinson Society Singapore members who have been diagnosed before age 60 or with/without school-going dependents. The support group meets every two months and also welcomes those who are newly diagnosed with Parkinson’s. The experiences of people who are diagnosed with young-onset Parkinson's disease (before the age of 60) are different from other people with Parkinson's. Each meeting will have a different talk conducted by medical professionals as well as a sharing session for participants to exchange tips and discuss experiences about life with Parkinson's disease. 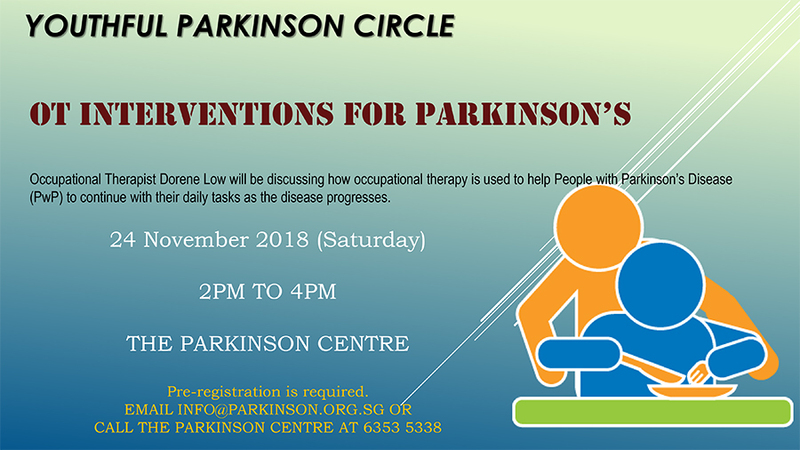 Registration is required, please email us at info@parkinson.org.sg. Click here for details of 2018 programme.